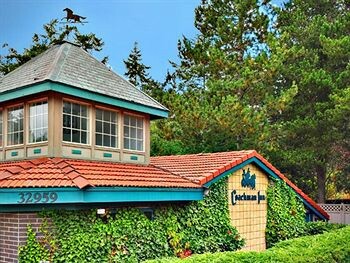 Property Location Located in Oak Harbor, Coachman Inn & Suites is convenient to Whidbey Playhouse and Flintstone Park. This property is within close proximity of PBY Memorial Foundation PBY-Naval Air Museum and Windjammer Park.Rooms Make yourself at home in one of the 100 guestrooms featuring refrigerators and microwaves. Complimentary wireless Internet access keeps you connected, and DVD players are provided for your entertainment. Conveniences include coffee/tea makers, as well as phones with free local calls.Rec, Spa, Premium Amenities Take advantage of recreational opportunities offered, including an outdoor pool, a spa tub, and a fitness center.Dining A complimentary cooked-to-order breakfast is included.Business, Other Amenities Featured amenities include a business center, dry cleaning/laundry services, and laundry facilities. Event facilities at this property consist of conference space and a meeting room. Free self parking is available onsite.